The third Footy Open of the 2012 Travellers series produced some exciting racing in very variable wind conditions. 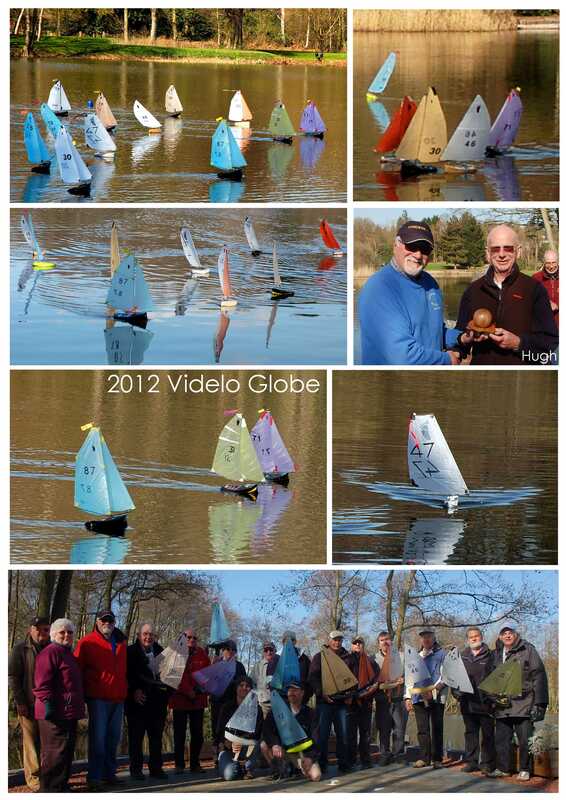 There were lots of new boats performing well first time out, as well as new design input and newcomers to Footy racing. Whilst the keen experienced sailor, Hugh McAdoo retained the trophy, he was beaten by 5 different boats, who won 7 of the 15 races. 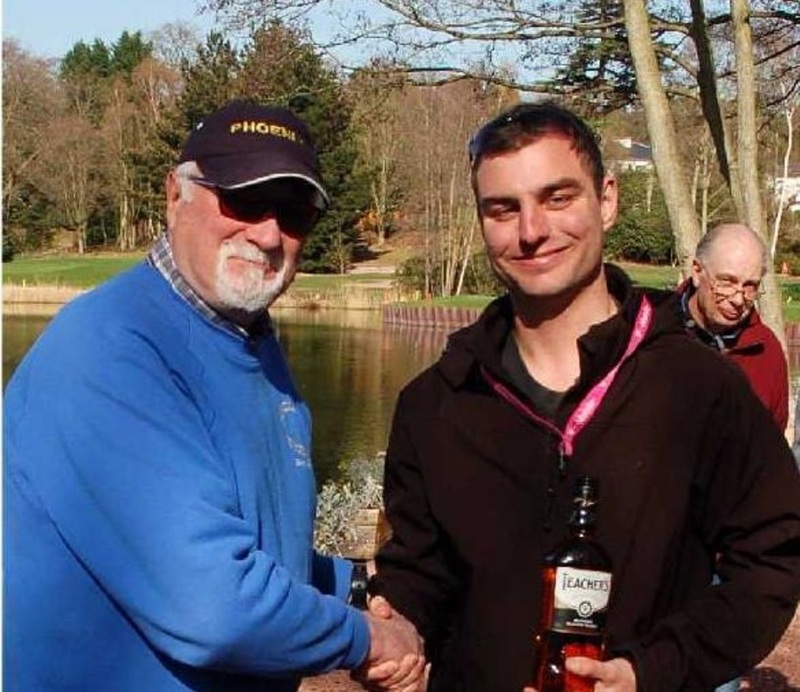 13 competitors from across the UK descended on Phoenix MMC’s water at Silvermere Golf Club on a beautiful sunny day and were greeted by a very cold light and variable north easterly wind. The Phoenix Club do not have permission to use a manned rescue boat so the marks were laid using a radio controlled power boat. The simple windward leeward course with a leeward gate was fine for the first few races with the wind relatively steady and the starting line adjusted using a pole on the bank, however the inability to reset these marks became a problem later. Predictably, Race 1 was won by the trophy holder, Hugh McAdoo sailing his ICE, with newcomer, Paul Risdale sailing a brand-new boat to his own design in second place and Peter Jackson with a brand-new ICE in third. However Hugh was not having it all his own way because in the next 3 races he was beaten into second place by Alan Viney, sailing another brand-new ICE. Hugh came back to form, winning from Scott Wallis sailing the very narrow Bill Hagerup designed RANGER, with Alan third in Race 5 and from Alan with Peter Shepherd third in Race 6 sailing an extended RAZOR 3 design by this American designer. By this time the windward leeward course had become a bit reachy, which Scott found to his liking, winning Race 7 from Peter Jackson and Gary Sanderson sailing his trusty DUCK II design. At lunch-time Hugh was leading with 9 points, ahead of Alan with 14 and Scott with 20.
made from the molds kindly loaned to him by Roger Stollery. He was even more happy when having pursued Hugh McAdoo for most of the day he finally took a victory in race 13. Before racing started again, more buoys were laid, as by now the wind could be either north-easterly, northerly or westerly because it was so variable. During the afternoon Race Officer, Roger Stollery changed the course to suit the varying wind almost every race. The afternoon started well for Hugh who won the first 3 races before letting Scott come back to win Race11 from MYA secretary, Chris Durant sailing another new ICE. Race 12 was a good one for Gary Sanderson, who won from Alan and Scott. Peter Jackson was absolutely delighted to win Race 13, achieving a long established ambition to beat Hugh into second place! However in Race 14 the tables were turned once again with Hugh winning from Peter and Alan. Hugh finished the day as he had started with a win in Race 15 from Scott and Gary, so regaining the beautiful wooden trophy given on memory of the late Frensham Pond SC MYG founder and Footy enthusiast, Don Videlo. The prizes were presented by Phoenix Commodore, Grahame Palmer and the prizewinners thanked the Phoenix club members who supported this event including Gordon Edmondson and……………………. for scoring the 15 races and Charles Smith for organising the event. 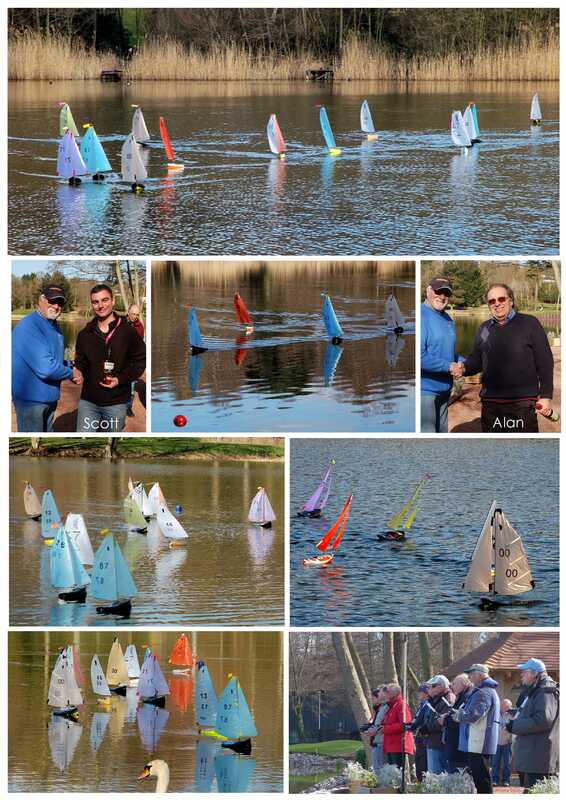 The Footy class was delighted to be able to use the Silvermere for the first time, as these little boats with their big sail areas thrive in the light fluky conditions associated with this water. It was a good quality fleet producing some very close racing, in part because the use of extra ‘ big ‘ rigs is prevented by the 2011 Experimental Rig Template, which was in use at this event. This helped to level up the performance of the light, narrow American designs with the wider, heavier English ones. As well as lots of new boats, it was good to see newcomers at this event, including those who have never raced radio boats before and those radio sailors who have never raced a Footy before. The next Footy Open event is the 2012 Footy Championship and Junior Championship to be held at Guildford MYC’s water at Abbey Meads, Chertsey on 19 May 2012. 13th Howard Denyer Phoenix (117) SUPABUG 173.